Nashville is a city on the move and their moment is now. That energy and excitement can be found in the new book Nashville: Scenes from the New American South, which is complete with 175 full-color and black and white photographs. 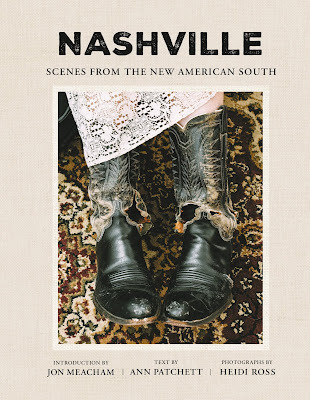 Bestselling novelist Ann Patchett and photographer Helen Ross capture the essence of the city today, which his both historic and iconic Nashville, as well as a place that's entirely new, a place that's a mecca for established and up-and-coming visionaries in art, film, and what they are most known for, music. Music City radiates a creative energy that's felt by longtime residents and first-time visitors alike. "Talent has been saving up gas money to get to Nashville for time immemorial. Talent has flourished and thrived, waited tables, sung at The Bluebird, signed a record deal, and made history. Talent, real talent, has also busked on the sidewalks, met with exhausting rejection, finally pawned its guitar and spent its last dollars getting drunk in Tootsie's Orchid Lounge (or nowadays, Dino's). Some people make it and some people don't. It's both a cliche and a fact. The interesting part is that a lot of the people who came with big dreams - met or unmet - decided to stay in Nahville to have a life. They got in the habit of walking the trails in Percy Warner Park in the morning or doing the loop around Radnor Lake. They liked the hot chicken, the meat-and-three, the independent bookstore. They made note of the fact that people were friendly, unusually friendly, even though most of the people they met weren't even from here. It's as if everyone got the same memo: If you want to pass for a local, you have to be nice. If the door that leads directly to the stage of the Grand Ole Opry didn't swing open, the doors to people's houses did, and so they stayed. They became the pioneers of the hip new East Nashville, of Germantown and the Nations. By the sheer force of their numbers and the shimmer of their talent, they shaped the city into something they owned." Pulitzer Prize-winning historian Jon Meacham writes the introduction, in which he addresses the city's deep traditions and progressive social nature. Meacham frames his discussion around renowned civil rights leader and Georgia congressman John Lewis, who, while a student in Nashville, organized numerous nonviolent sit-in movements that led to the desegregation of lunch counters downtown. In the context of Lewis' story, Meacham writes, "Nashville now feels like a vital part of that larger story - a place where old and new meet, and move forward, together." Patchett has been a resident of Nashville since childhood, and her observations resonate with details that capture the essence of her experience and memories, while also coming to this recognition. "As emotions go, nostalgia is both cheap and unrealistic," Patchett writes. "We can't go back. That's not the way time works. We have a bad habit of forgetting everything progress provides while mooning over a much-loved oak tree that was bulldozed. Sometimes we're not even nostalgic for things we liked, it was just that we were used to seeing a particular thing in a particular place. This is how the past works - the new thing sits in the place where the old thing was, except that in Nashville the changes come faster and more sweeping, more devouring, than anything I've ever seen." Patchett is a co-owner of Parnassus Books, and she has long felt the need for a quality book that accurately conveyed the heart of the city, writing that, "People come into Parnassus every single day looking for a book about Nashville that isn't just about the past but is about the city's vibrant present, our explosive NOW - a book for people moving to town and leaving town, a book for all those visiting bachelorettes and wedding parties, a book for the newbies as well as the longtime residents, the insiders and the tourists." The rich images from Heidi Ross capture all of what Patchett sees, bringing together the city's rich Southern roots, including traditional food and food festivals, famous performance venues, and recording studios; and its edgy, creative side, with the Buchanan Arts District, Pie Town (SoBro), Pride Festival, and Third Man Records. This book also includes many famous people who have called the city home, including Al Gore, John Prine, Delbert McClinton, Harmony Korine, and Jason Isbell and Amanda Shires. Meacham calls Ross' work "a great gift: a powerful visual record of a fascinating new hour in the life of an ancient place." The beautifully produced Nashville is a work that gives a rich history of the city while also serving as a tour guide if you are planning a trip to one of America's greatest cities.